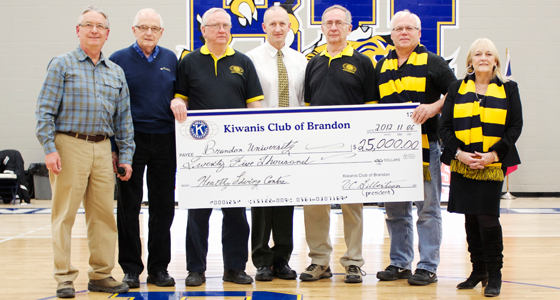 BRANDON, MB – Representatives from the Kiwanis Club of Brandon were on hand at the BU Bobcats men’s basketball game this past Friday evening to present Brandon University President and Vice-Chancellor, Dr. Deborah Poff, and BUILD Campaign chair, Dr. Tom Breneman, with a cheque for $25,000 in support of the new Brandon University Healthy Living Centre (HLC). The Kiwanis recently committed their support to the multi-purpose space located on the second level of the HLC. The multi-purpose space is set to regularly host recreation, fitness and wellness programming, and will be available for booking through the facility once construction is completed.